Every now and then, a pitch stands out from the noise that is my in-box. Brent from MoonJar.ca caught my attention right off the top by referencing my new pitch policy. As an Ottawa-based, family-run affiliate, he was concerned that he might not have enough Can-con to catch my attention. (!!) He and I are apparently leading parallel lives: he has three daughters, all of them within a year of the ages of my boys, also lives here in Ottawa, also drives a Mazda5, also has a yellow and red swing on the tree in his front yard… it’s spooky, really, in a funny kind of Internet way. All of which is of no real consequence at all, except to say that I was immediately endeared to him, and I was almost afraid to look into his product because even though I immediately liked him so much I was worried that he might be hawking something I had no interest in or could find no connection to, and I wouldn’t be able to help him out by promoting it here on the blog. So let me tell you about the Moon Jar moneybox. It’s the kind of quirky thing you see in specialty toy stores or at your cool friend’s house, the kind of thing that is both fun and functional, and makes you say, “Dang, why didn’t I think of that!” It’s elegant in it’s simplicity: a three-part bank in cheerful primary colours. One compartment is labelled “save”, one “spend” and one “share”. It helps teach kids about financial responsibility and opens the door to conversations about financial literacy. 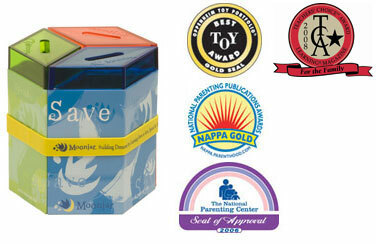 Since 2001, Moonjar has created Award Winning books, toys, games and the well known Moonjar Moneybox. Their goal is to recycle and transform time-tested principles into innovative, simple and high-quality products for a new generation of learners. We provide FUN products for independent young minds and innovative tools that address basic life skills. encourage families to keep their conversations going, about money and life. Did you know, by the way, that Canada has just launched a National Task Force on Financial Literacy? I’ve seen many references to the fact that poor financial literacy is one of the major contributing factors to the global financial meltdown earlier this year. Now, I’m not saying that by using the Moonjar Moneybox, you’ll help Wall Street recover and stabilize the TSX, but IMHO we should take any opportunity to help our kids learn about taking on financial responsibility as early as possible. When I opened the package of samples that Brent supplied, Tristan was looking over my shoulder in curiousity. (I think he was initially intrigued by the bright colours. He’s a magpie like his mother!) When I explained the various components of the “system” and the idea that if we started using the Moonjar moneybox for his allowance, he’d have to set aside a portion each week for saving and some for sharing with people who weren’t as lucky and fortunate as us, he was perfectly fine with the idea. Now, to be totally honest, we haven’t yet had a chance to implement the save/spend/share system because I wanted to get this information out to you right away. But so far, he’s intrigued and we’ve started talking about money — that’s more than half the battle, right? And Brent was generous enough to give us a complimentary set of MoonJar moneyboxes to share with you, my bloggy peeps! Tristan has already laid claim on one of them, but I have one more Classic MoonJar and two Standard MoonJars (these ones are made of cardboard and you assemble them yourself) to give away. Entries will be accepted through 5 pm EDT on Thursday September 3, 2009. Three winners will be chosen at random based on the entries received. The first person chosen will receive the Classic MoonJar, and the next two will receive the Standard MoonJar. You must be willing to share your home mailing address with me so I can ship the prize to you. By the way, I know some of you are elementary school teachers, and Brent says he is strongly focused on the teaching aspect of the MoonJars. They’ve got some good information on saving and spending on their resources page, and they’ve developed curriculum for elementary schools. Contact him for details! Those moon jars look great! I’ve been thinking of getting something similar ever since @summerm talked about them on twitter. I wish my parents had taught me about making a budget, and let me experience the consequences of messing up my budget. Oh this MoonJar concept rocks! We have just been debating exactly how to deal with money in our home. My daughter received money for helping her Nan and she had spent it in her mind before the $20 bill arrived into her palm. So, in order to be included in this awesome draw, here is my tip for family literacy when it comes to molah! We don’t just say something costs $5. Instead we relate it to the cost of actual goods. For instance, my daughter will walk into Giant Tiger and immediately eye a packet of Pokemon cards that are $5. She knows that they cost $5, but it is meaningless in some ways to her. So we explain that with $5, we can buy one packet of Pokemon cards or two loaves of bread. It helps her understand the actual value. I think this is brilliant!!!! My kids are too young for allowances but I think that when it comes time I will assign specific chores that are their own. Like a job of sorts. I’m TERRIBLE with money. I wish that my parents had insisted that I’d saved a portion of any money received. You know? About a year ago, we posted Sam’s first chore chart on the fridge. We came up with six different responsibilities we wanted him to start assuming around the house and found clip art images for each. Then we added five blank squares below each image, space for the initials that would attest that a job was done. We didn’t ask him to make sure he did one or more of his ‘chores’ every day; in fact, it generally takes him about two months to fill in the 30 squares. When he’s done that, he can buy a new toy valued at about $25. He’s been working on the concept of saving in that he’s recently banked a chore chart because he has his eye on some $50 King Arthur Lego. But I love the idea of adding “share” to his growing sense of fiscal responsibility—plus, I’d like him to see the actual money as a tangible thing, and not just a concept. The Moonjar looks like an awesome way to introduce these ideas. Count me in for the giveaway! My girls are just coming up on the money thing – at 2 and 3. So this product sounds like something I could use. As a kid I was reknown for being the moneybags – I was a total hoarder. Didn’t really hold into adulthood, as I am now the one who would throw money at any problem to make it go away – if there is money available! Anyway… in between, I was a teenager, and my parents did a smart thing with me. I had a total budget allowance that covered everything except shoes. If I wanted to spend on experiences rather than clothes, I had to suffer the consequences. I had a lot of fun, and learned to live with what I could afford. *Ahem* So what’s the big idea with stealth marketing your Mothership photos? Where are the strobe lights and flashing arrows to drag my eye to your sidebar? WHO ARE YOU that you’d slip that in and pretend it had nothing to do with you!? A tiny little “New!” by way of announcement? Pshaw! It’s called a “grand opening” cuz it’s supposed to be GRAND. Cut the ribbon! Cue the music! Release the balloons! The Esty shop is open! Congrats! I’m buying “Umbrellas” for my dining room. And not just because it already has more than 1100 votes in the CRA’s national photo contest (praise! praise!) It’s because I heart it personally… Lovely work! Good luck with the shop! I love the idea and I have to admit that we had implemented this sort of ratio to my sons allowance at the start of the summer (he just turned 8). Of course that is only when I actually remember to give him his allowance. I am a work in progress. I like the share idea a lot. There are many many opportunities for “sharing” with our schools doing so much child centered fundraising for charities now. They do this so much more than they did when we were kids. What a great idea! I love that it is a tangible, visible way to see where the money goes. This is a great idea for my six year old. > No allowance yet. I’ve been putting it off. I think we really have to start. And this would be the proverbial kick in the pants for us. I’m thinking we will start with $4 a week. But I don’t know. I’m adding this to the list of topics hubs and I have to talk about. Oh wow, what terrific responses from everybody so far! Chantal, you gave me a great idea — use money from the “share” portion of the jar to support all those things that come up during the school year like the Shoebox gift campaign, toonies for the foodbank, etc. Great stuff! we really need this. my daughter (and her Scottish roots) firmly holds onto all money she recieves and has a very difficult time parting with it. we use kijiji, consigment and garage sales quite a bit – our kids keep whatever they make on the sale of their toys, but that money must get reinvested into new toys if they want new stuff. works well for us. i love the idea of introducing “sharing”. Our son is too small for an allowance, but he has piggy bank with no hole just like his parents. Everytime his grandparents come out they add something for him. We have a piggybank with no hole to save for something big for ourselves. We have been doing it for a couple years and it really works. We tend to blow our loonies and twoonies on coffee, cookies and other things from the coffee shops, so our family rule is that all loonies and twoonies need to go in the pig, that way we can’t blow them! Once the pig is full we break it open and buy something big for ourselves. Sometimes we know what it will be, and other times we don’t until we count it up. My parents always reinforced saving to me, and I started investing with a financial planner before I was even in university. At the same time they taught me how to spend and how to give. Giving can be of money or our time which is just as valuable. I just wanted to post to say, I’m glad to hear about other people who are enthrall to Pokemon, because I can no longer go to Target with my children because of the non-stop pleading. We give our third-graders three dollars a week. The allowance is given immediately after they do approximately an hour of cleaning-up chores, and it is docked by a dollar if they haven’t made their beds more-or-less every day for the previous week. This is our third or fourth attempt at allowances — they’ve lost track of them in the past, and so have we. We’ll see if this one works. We hand over quarters or dollars for the kids to put in the collection plate at church on Sundays — given the lack of attention to allowances up until now, we haven’t fretted that the money isn’t coming from their pockets. I know we should fix that, but right now, just having enough change for the allowances seems like hassle enough. A truly lame excuse, but there you go. My daughter, age 6, has been interested in money since the day she could count up to 10. To help her understand the value of money, my husband and I often deliberately think out loud about our buying (and sharing) decisions. For example, in the grocery store, she’ll hear me compare the cost of a box of cake mix with the cost to buy the from scratch ingredients, which can make many more cakes. She’s at the point now where she wants to bring her coin purse with her allowance in it whenever we go out shopping, but on most occasions she doesn’t buy anything because she’s talked herself out of it, having reasoned that the desired item wasn’t worth it. I love, love, love this idea . Must buy one for my Goddaughter. Wow, what a timely post. We are currently pondering this dilemma in our house. We don’t yet give our 7yr old an allowance as I’m afraid of getting into a situation where he does chores because he’s paid as opposed to because he’s being asked and is part of the family. I was raised with allowance for chores and my hubby wasn’t and I really think it shows in his work ethic compared to mine. The fact that he is a total hoarder doesn’t help as he wants to put EVERYTHING in his bank account…so unlike his mother. I will say, that we recently said he needs to do jobs around the house to show he is responsible enough for an allowance. I know this isn’t very coherent, but this is a timely post for us as it’s been muddling around in my head for the last couple weeks. I would love a moonjar however, as we NEED him to be much more cognizant of the share component, and this may put it into context for him. BTW…what’s up with that back to school picture? We don’t go back until the 11th. Eleven.more.days….and my summer activity list has long dried up! I second Trixie – blow the horn Dani. The new Etsy shop calls for an actual post, okay?! Love the idea of a money jar, and am especially thrilled to see the “share” portion. At three, Jake doesn’t really “get” money, but sharing it is something he’s already good at – thank heavens! Before getting married I worked in ministry full time for a below-the-poverty-line wage. I learned to budget very effectively, though looked forward to giving it all up when I finally got married and then eventually moved on to a more financially lucrative position. Imagine my surprise (not!) when I found that more money didn’t make our financial situation any easier – it just gave us more to manage. My financial literacy tip is to keep a budget, not just for your kids’ allowances, but for your household expenses and savings. It’s kept us from making some poor impulse buys and during these tough economic times we are not worried about losing our jobs as we have enough set aside for that rainy day. Live within your means and carry no debt outside of a mortgage you can actually afford on half your current income. I love the share/save/spend idea! My kids are too young right now but this is how we want to approach money (although, I am torn about allowances). As a kid, I do wish I had learned to do good budgets, even when young, and especially when I started working before I left for school. i’m torn about allowances — my kids (3 and 5) are expected to do chores around the house as a part of being a family (so I don’t want to give an allowance dependent on chores). I know they need to learn how to manage money and how to save. Currently, birthday money comes in and is spent in no time (although the 3 year old just bought a few books and a DVD and decided to save the rest until she sees something she really wants). I would really like to get into a save/spend/share routine with them, and I’ve been thinking about making a 3 jar system. I guess I’ll also have to decide what’s an appropriate allowance. I have to say though, my 5 year old recently told me that he wants to sell his duplo and trucks to get money to buy Lego. I’ve been doing this with my 5-year-old daughter since last year. People always gasp when I tell them how much she gets each week as an allowance until I explain how it works. She get $5 every week: $2 for spending, $2 for saving and $1 for charity. It works really well and she’s starting to understand the concept of saving her spending money for something big. She’s even started choosing not to buy things when she finds out how much they cost. I love this. What a great idea. My kids love to count money but have no real interest in saving for stuff and I find that kind of maddening. But they’ve got the give it away bit down frankly a little too well. Literally my artsy sensitive daughter 8 will see the guy outside the bank who is there every week asking for money for a bus ticket home to Toronto and always ask for money to give him or take money out of her own pocket. I mean I had to stop going to that bank. She’s too sweet and wondering why he hasn’t made it home yet. He’s got at least $20 of hers and my funds so pretty sure he isn’t buying a ticket. Anyways, I don’t do allowances. Maybe that makes me really a lame mom but we have what we need and they get what they need. And we all pitch in without financial motivation. At 5 and 8 what are they going to spend it on anyways? And my five-year-old whom I love madly only likes to sit and count money like for hours. She could do that all day if I let her dump the piggy banks out and count, but for buying stuff nope no interest yet. So I could really use something like this to help encourage them. Really if my financial future is in their hands I am scre$ed. We have been haphazardly doling out allowance to our six-year-old for almost a year (meaning only when she remembers to ask for it!) with the spend/save/give ratio. It seemed to make sense to give $3 week to make an even split and, per the sage Barbara Coloroso’s recommendation, we don’t tie it to chores because it opens the door to the notion that you only contribute to the household/help other people if you get paid for it. What a great concept. My husband is an elementary school teacher (well, supply teacher at the moment but we have high hopes of him getting a class in a few years. *sigh*) and this would be a great teaching tool. I’ll have to forward the links to him. Our jellybean is only 2, so we haven’t started an allowance yet, but we fully plan to. And with said allowance will come the explination that if you want something that isn’t a basic need, then you can spend you allowance on it. Like Pokemon cards, or whatever the trend is when he is 5 (when we will start his alloawances). Yes, I have been thinking about this already. My parents gave us allowances, always chore related and increased with age. I learned how to save money for things I really wanted. I think that is how I learned to be frugal. A handy trait to have when you are on one salary. Hum… I had never though about giving allowance to my daughter. Not yet I guess (3 and a big half). She is learning what is money, what we use it for and I am trying to explain her that the ‘cards’ don’t allow us to buy anything we want. This plastic version of money seems very confusing to her. I take some cues here from all those comments. As for me, I inherited money at a young age and my parents always told me what they were doing wth it, how much I was allowed to spend and what it was really for (university fees). I guess they did well, ’cause I didn’t spend it all on my 18th birthday. I can’t wish that for my daugther, but I should be inspired by it and use this experience with her. I should start the allowance soon and explain those concepts to her. On her birthday maybe? My kids are too little to currently get an allowance although the oldest is just starting to understand that things cost money. But I really like this idea for the future. I was taught fairly good financial literacy skills from my parents – perhaps helped by the fact that my dad is an RBC executive? But we never put a proportion towards ‘sharing’ or charity. And I really like the idea of instilling that in my children. In fact, I am very cheap when it comes to financial donations (I spend most of my work like ‘helping’) — I would really like to recitify that in my kids! These look awesome! I have been wanting to start talking more about money with my 3 year old but haven’t got around to it yet. One thing I wish I had done asa child and hope to do with the girl is more sharing. I was a saver but I never gave any money away. I like the idea that she could choose where to send/ give money to every month. She doesn’t even have an allowance yet. I don’t even know what age to start at. Hmm, must think more. oooo, ooooo, add me to the list–and just under the wire, I might add. My tip on teaching financial literacy: each season have your child clean out their own drawers and make piles of clothes to pass down to friends, keep for next year, or give to Goodwill. Then, together, do an audit of exactly what clothes/shoes will be needed for the upcoming year and make a list and set a budget before hitting the shops. Try shopping at Value Village first before hitting the mall in order to maximize the budget. My son isn’t old enough for an allowance yet ( just over one) but we’ve planned it out. It won’t be based on chores as we believe that doing them is intrinsically part of being in a family, so we are straight up going with the age thing. The allowance is half your age, per week, with no advances. We hope that will strongly encourage saving! My girls are 5 and 7 and I haven’t started allowances yet – partially because I believe that “chores” should be done because you are part of the family and you helped make the house messy, so you can help me clean it… but also because I just haven’t been sure how to start it! These banks are a great idea, and even if I don’t win one, they’re a tempting purchase! My dad always gave me a fixed amount as a child, but I wish he hadn’t! It didn’t set up much of a sense of value! It’s sure is interesting reading how different families approach the issue of money with their kids. Our son, 9, doesn’t get an allowance. He gets some money for his birthday from grandparents, receives musical scholarships(which he puts back into his music in one way or another), occasionally busks to raise money which he splits between charity and his bank account, and if he finds himself short, will do specific jobs for a couple extra dollars. (ie, he dusted all the old style baseboards in the house one day). He does have routine chores for being part of the family and learning life skills. Fortunately he has never been a kid who wants a lot of “things” . He mostly spends his money on small presents for birthdays and spending money for souvenirs while travelling during summer vacation. He loves to share his money and recently adopted a manatee, previously adopted a deer, bought toiletries for a woman’s shelter, and raised money for an environmental charity. I expect that his needs/desires may change once he hits puberty, and we’ll have to consider what will work then.